After your tour of the virtual cemetery, don't forget to visit the official CemeteryGuide.com store on your way out. Thanks! Sept. 12, 2010 -- Hayes Edward "Big Ed" Sanders was one of the most talented and accomplished athletes to ever come out of Southern California. In college, he was on the football, basketball and track teams, and those who saw him compete said he could have easily become an Olympic decathlon champion. Instead, he focused on boxing. He won a string of national college titles and Golden Gloves championships, and went to the 1952 Olympic Games. At the age of 22, he became the first American gold medal winner in the heavyweight division, setting the stage for future Olympic champions Cassius Clay (later Muhammad Ali) in the light-heavyweight division in 1960, and heavyweights Joe Frazier in 1964 and George Forman in 1968. In addition to his impressive athletic skills, he was also known as a gentleman and a family man. He never forgot his roots in the Watts neighborhood of Los Angeles. He never forgot his family. He read the Bible and prayed for guidance before ever fight. He enlisted in the Navy, prepared to serve his country. And, when his military service ended, he was planning to finish his college education and become a coach. In the boxing ring, he was big, fast, intelligent and extremely powerful with both hands. Most of his victories were early knockouts. Among boxing fans and experts, it wasn't a question of whether Sanders would become the heavyweight boxing champion of the world. It was only a question of when. Sadly, he never got the chance. Sanders was born March 24, 1930. As a youngster, he collected coffee cans, filled them with cement, hung them from a steel bar, and created a weight-lifting set. He eventually grew up to be 6-foot-4, 220 pounds. Sanders attended Jordan High School in Los Angeles, and played on the football and basketball teams. After high school, he went to Compton Junior College, where the 18-year-old wanted to join the school's boxing team. But he needed a signed permission slip from one of his parents. He first asked his mother, but she refused. So Sanders' father signed the permission slip, and Sanders joined the college's boxing team. Within two years, he twice won the National Junior College Boxing Championship in the heavyweight division. Sanders received an athletic scholarship to Idaho State College, where he continued boxing, and also competed on the track team. During a one-day track meet, Sanders won the broad jump and the high jump, anchored the winning mile relay team, finished second in the discus, and third in the shot put. In 1951, Sanders enlisted in the Navy, and was stationed at the Naval Training Center in San Diego. He continued his boxing career as a member of the U.S. Navy Boxing Team. After winning the Golden Gloves tournament in San Diego by beating the defending champion in 1952, Sanders entered the Golden Gloves tournament in Los Angeles, and was described as "the finest heavyweight prospect to come down the pike since Joe Louis jumped from the Golden Gloves to world-wide fame." Sanders won again in Los Angeles, and it was on to Chicago for the national Golden Gloves Tournament of Champions. Sanders also won the title in Chicago, as well as the Joe Louis Sportsmanship Trophy, and then went on a month-long tour of Europe with the other Golden Gloves champions. At the time of the European tour, Arch Ward, the sports editor of the Chicago Tribune and creator of the Golden Gloves tournament, said Sanders had all the tools necessary to make him a future world heavyweight boxing champion, except for one -- the killer instinct. "When he has his man pummeled," Ward said, "he drops his hands and smiles." Sanders did plenty of pummeling on the European tour, defeating the heavyweight champions of Ireland, Germany, France and Italy and returning home undefeated. 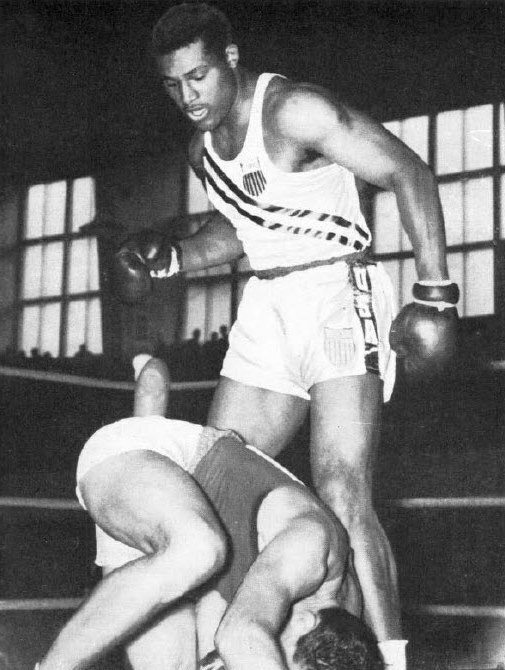 In June 1952, Sanders won a spot on the U.S. Olympic boxing team, and was named captain of the team that also included future world champion Floyd Patterson. In his first Olympic fight in Helsinki, Finland, Sanders won with a first-round knockout, and his opponent, Hans Jost of Switzerland, had to be carried back to his corner. In his second fight, Sanders defeated Giacomo Di Segni of Italy with a third-round knockout. He reached the championship fight after knocking out Andries Nieman of South Africa in the second round. Sanders faced Sweden's Ingemar Johansson for the Gold Medal. With the Olympics being held in Finland, Johansson was certainly the home-town favorite, but the crowd never really got a change to see them fight. Johansson danced away from Sanders for the first two rounds of the three-round fight, circling around the edges of the ring. At the start of the third and final round, while Johansson continued to dance away from Sanders, the referee called the fight, disqualified Johansson, and awarded the victory and the Gold Medal to Sanders. Even the home-town crowd booed Johansson as he left the ring, and he was escorted out of the stadium by police officers for his own protection. Paul Zimmerman, sports editor for the Los Angeles Times, described the fight as "the greatest retreat since the allies swept through Germany in World War II." As Sanders stood on the platform to accept his Gold Medal, the spot next to him, where the Silver Medalist would have stood, was vacant. "I had power tonight," Sanders said after the fight, "but I never got a chance to use it. I never had a chance to hit him even once." After the fight, Johansson claimed that he was just using strategy. His plan was to wear out the bigger Sanders by dancing around the first two rounds and some of the third before he would unleash an attack on him. At the time, no one believed him. But in 1959, Johansson used that exact technique against Floyd Patterson, dancing away from him for most of the first two rounds and then unleashing an assault in the third round to win the world heavyweight championship. (In 1974, Muhammad Ali used the same strategy, which he called the "rope-a-dope," to defeat George Foreman for the heavyweight title.) Johansson eventually became a popular champion and, in 1982, 30 years after he was denied at the Olympic games, he was finally awarded the Silver Medal. The International Olympic Committee's Official Olympic Report of the 1952 Helsinki games described Sanders' route to the Gold Medal: "In the heavyweight class, not a single one of the American Edgar (sic) Sanders' opponents stood up to him all three rounds, not even the technically skillful Andries Nieman of South Africa in the semi-finals. His opponent in the final was Ingemar Johansson of Sweden, who had gained a 2-1 victory over the Finn Ilkka Koski in the semi-finals. Obviously afraid of the American's hard punches, the Swede resorted to wholly passive and evading tactics. This caused the French referee R. Vaisberg to disqualify him in the second round. Johansson was not given the Silver Medal." To see a video of the Sanders-Johansson Olympic fight -- and to get an idea of Sanders' speed and power, and why Johansson was probably smart to run away from him -- click here. After he won the Olympic Gold Medal, Sanders' mother -- who four years earlier had refused to sign the permission slip to allow her son to join the Compton Junior College boxing team -- said she wouldn't try to discourage her son if he decided to turn professional. "I tried to discourage him once," she said, "but never again. He's a determined young man. He can take care of himself." After the Olympics, Sanders, who was welcomed back to Los Angeles with a parade in his honor, announced his plans to turn pro. At the time, he had fought 47 amateur fights, with 43 wins -- including 36 by knockout -- and only four losses. Sanders said his plans also included returning to Idaho State College after his stint in the Navy ended in 1955, getting his degree in physical education, and becoming a coach. On Sept. 22, 1952, Sanders married Mary Elizabeth La Rue, who he met while in college in Idaho. 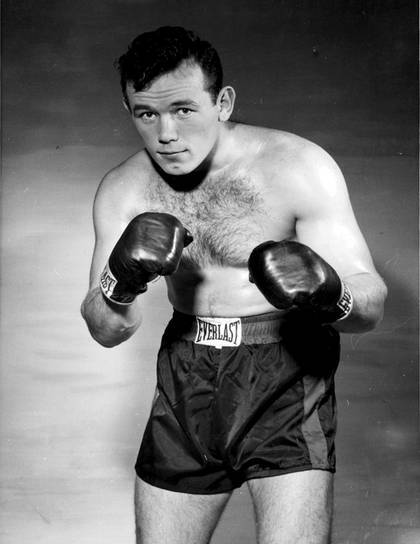 Sanders picked up where he left off in the Golden Gloves tournament in 1953, winning in San Diego and Los Angeles before finally losing what was called a "disputed decision" in the title fight at the Tournament of Champions in Chicago to a 30-year-old unknown steel mill worker from St. Louis named Charles Liston. 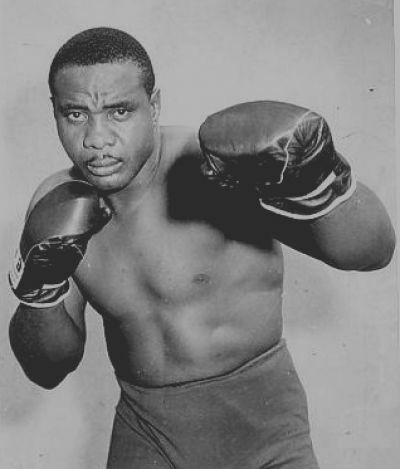 Liston took up boxing while he was serving time in prison for robbery, and had been released on parole only five months before the Chicago tournament. It was later revealed that Sanders fought his last two fights with a fractured hand. On June 28, 1953, Sanders' wife, Mary, gave birth to the couple's first child, a boy named Russell, at the San Diego Naval Hospital. Later that year, Sanders was transferred by the Navy to Boston. Sanders didn't participate in the Golden Gloves tournament in 1954. Now that he had a wife and child to support, Sanders needed an income. He decided it was time to turn pro, and he would be his own manager. Sanders made his professional boxing debut on March 8, 1954, beating Sonny Nichols on a technical knockout in the first round at Boston Garden. Sanders won his second professional fight on April 1, 1954, knocking out Billy Booker in the first round, dropping Booker first for a mandatory eight count with a right to the head, then knocking him out with two quick lefts. Sanders won his third fight on April 10, 1954, by knocking out Henry Anderson in the second round. Sanders was finally stopped on April 24, 1954, by Willie Wilson, losing a five-round decision. On May 22, 1954, Sanders beat Jack Flood, who was disqualified for refusing to answer the bell in the fourth round. Flood blamed a stomach injury. On Aug. 12, 1954, Sanders avenged his loss to Wilson, beating him in an eight-round decision. On Oct. 5, 1954, Sanders fought to a 10-round draw against Burt Whitehurst. On Oct. 26, 1954, won a unanimous 10-round decision in a rematch against Whitehurst. Sanders had fought eight professional fights in less than eight months, with six wins, one loss and one draw, and three knockouts. Already, there was speculation as to when he would get a shot at the heavyweight champion, Rocky Marciano. But as his professional career progressed, Sanders was becoming less effective at dispatching his opponents in the early rounds. His first three fights were knockouts in the first or second round. His last three fights lasted eight, 10 and 10 rounds, and ring spectators said Sanders appeared to be increasingly tired during the bouts. 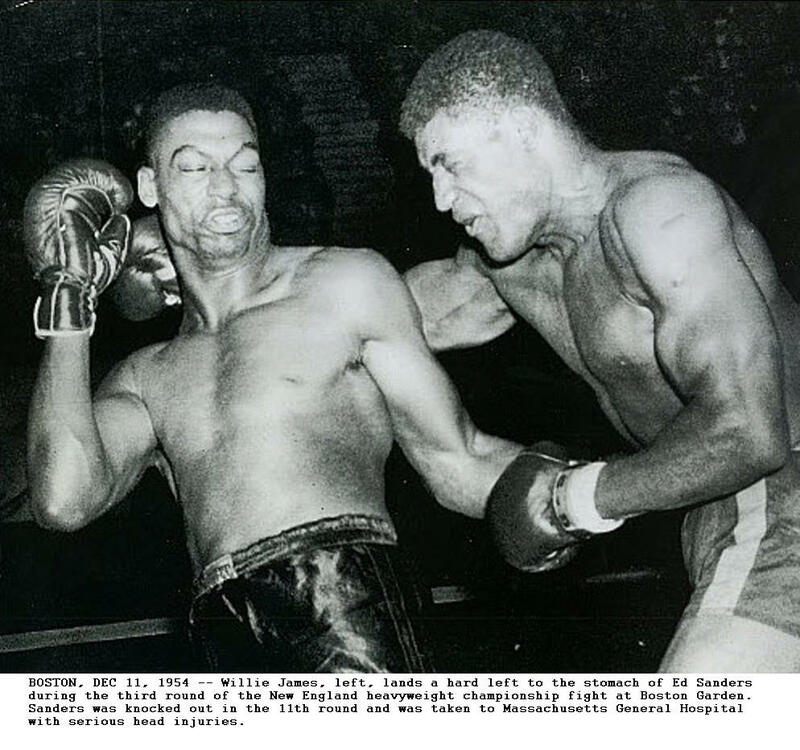 On Dec. 11, 1954, Sanders challenged Willie James for the New England heavyweight title in a 12-round fight at Boston Garden. At the time, James had a record of 17 wins -- 12 by knockout -- six losses and one draw. Although James was the defending champion, Sanders was the favorite. James appeared to be leading in the early rounds, landing a heavy barrage of punches, but Sanders rallied in the later rounds. Twenty-five seconds into the 11th round, James caught Sanders with a hard left hook, then a right cross to the head. Sanders fell on his right side, then rolled over onto his stomach, unconscious. Sanders' gloves were quickly removed and the tape cut from his hands as ring attendants tried to revive him. Dr. Samuel Sandler, the Massachusetts Boxing Commission's ringside physician, rushed into the ring, ordered that Sanders be taken out on a stretcher, and called for an ambulance. Sanders was still unconscious and breathing heavily after 20 minutes, and was taken to Massachusetts General Hospital. Sanders was taken into surgery at midnight to relieve a blood clot on his brain. The surgery ended four hours later. Shortly after Sanders' wife, Mary, who had been at ringside during the fight, came into his room, he died at 4:30 p.m. on Dec. 12, 18 hours after he was carried out of Boston Garden. He never regained consciousness, and a hospital spokesman said the cause of death was intercranial hemorrhage. He was 24 years old. In addition to his wife and 17-month-old son, Sanders was survived by his parents; two brothers, Donald and Stan; and a sister, Margaret. Surgeon Dr. William Sweet said Sanders was bleeding from "more than one point inside the skull" when he was brought to the hospital. "Only one blow might have done it, but more likely it was several." Willie James, Sanders' opponent in his final fight, came to the hospital, and kept repeating, "I'm terribly sorry." "I didn't think I hit him that hard," James said. "I've scored knockouts before where I hit the man much harder. I hit him an uppercut in the 10th round, the hardest punch of the fight. I didn't realize he was badly hurt at the time he went down. I thought he would come to in a few minutes." James fought once more. He was knocked out in the second round by Bob Baker in Baltimore on Feb. 9, 1955, then retired with a record of 18 wins, six losses and one draw. An autopsy revealed that Sanders had suffered two brain hemorrhages in the fights with Whitehurst. Sanders complained of headaches after the fights, but his injuries went untreated. Following an inquest into Sanders' death in Boston, Chief Municipal Court Justice Elijan Adlow said there was no cause for criminal action, but noted that the welfare of boxers "has been subordinated to the spectators' lust for brutality." Adlow, who called Sanders' death "needless," further said that if there were no law making boxing legal, "an assault entailing such consequences would constitute murder." More than 300 people attended Sanders' funeral services at Grace Methodist Episcopal Church. Sanders was buried with military honors at Woodlawn Cemetery in Santa Monica. On Jan. 17, 1955, a benefit boxing match was held at Boston Garden -- the scene of Sanders' final fight -- with the proceeds going to Sanders' widow and child. Sanders' death leaves the question of what might have been. Would he have been able to recover if he hadn't fought so often in such a short period of time? At the time of Sanders' death at 24, Rocky Marciano, the heavyweight champion, was 31 years old. Marciano defeated Archie Moore on Sept. 21, 1955, in his final title defense, then announced his retirement seven months later. The next three heavyweight champions -- Floyd Patterson, Ingemar Johansson and Sonny Liston -- all have a link to Ed Sanders. After Marciano's retirement, an elimination tournament was held to crown his successor. On Nov. 30, 1956, Patterson -- Sanders' Olympic teammate in Helsinki -- defeated Moore to win the title. At 21 years, 10 months old -- about five years younger than Sanders would have been -- Patterson became the youngest world heavyweight champion in history. On June 26, 1959, Johansson -- the boxer who ran from Sanders in the 1952 Olympic championship fight -- defeated Patterson to take the heavyweight title. A year later, on June 20, 1960, Patterson knocked Johansson out to reclaim the title. On Sept. 25, 1962, Patterson lost the title Liston -- the boxer who defeated Sanders for the Chicago Golden Gloves title in 1953 -- in a first-round knockout. Ed Sanders' influence and legacy didn't end with his death. His younger brother Stan, who was 12 years old when Ed Sanders died, followed in his athletic footsteps, starring in football, basketball and track at Whittier College, and was touted as an Olympic decathlon prospect. On the football field, Stan Sanders was one of the nation's top small-college receivers, and was named to the National Association of Intercollegiate Athletics' All-America team. Off the field, he was the college's student body president and was president of the California Association of Student Councils. He was later elected to the Whittier College athletic Hall of Fame. Stan Sanders graduated from Whittier College in the top 10 percent of his class. He majored in political science in college, and was a Rhodes Scholarship nominee with plans to become a lawyer. He was selected by both the New York Giants in the ninth round of the American Football League draft, and by the Chicago Bears the fourth round of the National Football League draft. Two weeks after the professional football draft, Stan Sanders was named a Rhodes Scholar. He decided to put his football career on hold to attend Oxford University for two years, then received his law degree from Yale University. He returned to his hometown to become a social activist, working tirelessly to help improve the quality of life for the residents of his community. He became a partner in a Beverly Hills law firm, but he continued to live in Watts, where he was born and raised, and where his family still lived. Stan Sanders served as an advisor to L.A. Mayor Tom Bradley, and ran for mayor himself in 1993. Nearly 20 years after Ed Sanders' death, his younger brother still called him "the most influential person" in his life. "He had qualities of steel and velvet," Stan Sanders said. "He was big and tough, yet at the same time he was a nice guy."